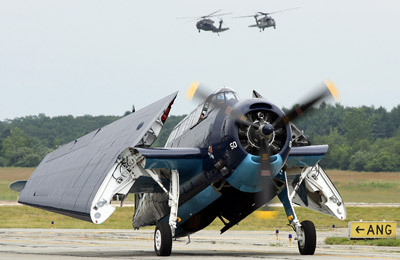 The 2011 Rhode Island National Guard Air Show and Open House was held at the Quonset Air National Guard Base, North Kingstown, RI, on June 25-26. Photo report by David Clifton of the airshow acts, which included the U.S. Navy Blue Angels. The Rhode Island National Guard Air Show and Open House always draws out the aircraft enthusiasts from the woodwork. If you like watching and listening to aircraft tearing up the sky above you, or if you like walking around admiring the aircraft from yester-year to aircraft of today, this show has it all. The weather for the two days was forecasted to be mostly cloudy with little or no sunshine, Saturday turned out to be the better of the two. This year some of the performers scheduled to appear included Sean D. Tucker, Michael Goulian, John Klatt, ANG Jet Truck, USASOC Jump Team - The Black Daggers, F-16 Viper East, Red Bull Jump Team & Aerobatic Helicopter, Grumman TBM Avenger, The Horsemen, and the USN Blue Angels. With Saturday starting out overcast, it took sometime for the cloud base to lift to the required 1000 feet ceiling before any aircraft could take to the skies to dazzle the crowd. The civilian acts started with Chuck Aaron in his Red Bull Aerobatic Helicopter doing things that can only be described as breathtaking. Other civilian acts were Sean D. Tucker who took to the skies and 'wowed' the crowd by making his custom-built aircraft do anything that he asked it to do. Michael Goulian flew his Extra 330SC aircraft in his aggressive and 'all out' style that he is known for. John Klatt took to the skies in his Air National Guard Panzl S330 to stun the crowd of onlookers. Before John finished Neal Darnell rolled on to the runway in his Air National Guard Jet truck and challenged John to a race. The military side of the air show consisted of F-16 Viper East demo; Maj. Ryan 'Rider' Corrigan took to the skies and showed the crowd some of the things that an F-16 is capable of doing. Next the Grumman TBM Avenger rolled down the runway, having its wings folded back along its fuselage as if it were on the deck of an aircraft carrier. 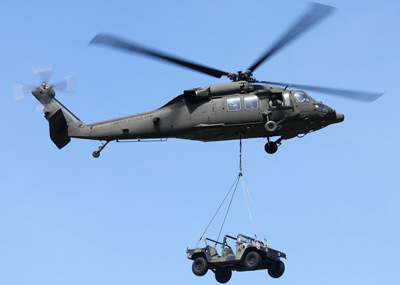 The hosting air wing, the 143rd out of Quonset, showed the crowd its UH-60 Blackhawks. And in an unannounced fly-by, straight from Allentown, PA, came the Horsemen. Flying the Grumman F8F Bearcat from the 1940s showing the crowd that aircraft from the past still have a place in an air show with modern aircraft. And in honoring the 100 years of Naval Aviation came the Heritage flight. This year the Heritage flight consisted of a P-51 Mustang and the F-16 Viper. This year as in past years there was a Combined Arms demo, leading the way for this CA demo was the hosting air wing's C-130J Super Hercules. The CA demo shows how the different branches of the military (Army, Navy, Air Force, and Marines) work together to achieve a common goal or to rescue injured personnel who might be trapped behind enemy lines. Once the Combined Arms demo was finished and any ground fires were put out, it was time for the headline group to take to the sky and dazzle the crowd of onlookers. 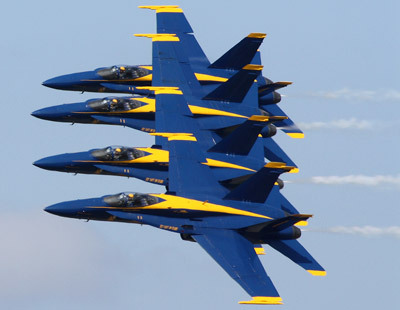 I am talking about the United States Navy flight demonstration squadron, the Blue Angels. To start off the Blue Angels show, their cargo and support aircraft, a C-130 known as 'Fat Albert', showed the crowd that it is possible to take a large aircraft and land it in a small area. Once Fat Albert finished and taxied off the flight line it was time for the Blue Angels' six F/A-18 Hornets to perform. With Angels 1-4 performing close formation moves, while Angels 5-6 performed the high speed fly-bys; the Blue Angels part of the show 'flew' by. At the end of their performance, the six Angels came by in a Delta formation to demonstrate a carrier landing. And with all six Angels on the ground, the 2011 Rhode Island National Guard Open House and Air Show came to an end. I would like to thank the Rhode Island 143rd air wing of the Air National Guard for hosting the Open House and Air Show, along with thanks going to Lt. Col Denis Riel and Sgt. Megan Burmeister of the Rhode Island National Guard Public Affairs Office for the opportunity to attend and take part in the 2011 Rhode Island National Guard Open House and Air Show.